El Niño-Southern Oscillation (ENSO) is a global coupled ocean-atmosphere phenomenon. El Niño and La Niña are opposite phases of the ENSO cycle in the tropical Pacific Ocean. 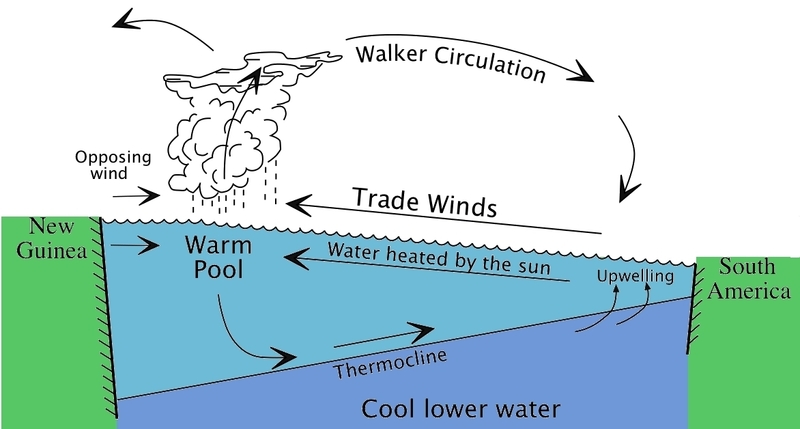 It all starts with a coupled ocean-atmosphere interaction in which the winds determine the water temperature but the water temperature also determines the winds. Pacific Ocean under normal conditions. Source: W.S. Kessler, NOAA/PMEL. 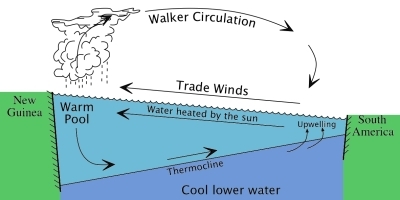 In a normal year, trade winds blow westward and push warm surface water towards Australia and New Guinea. Because of the force of the trades, sea level in New Guinea is about 0.5 m higher than in Peru. When warm water builds up in the Western Pacific Ocean, cold water wells up off South America's western coast. 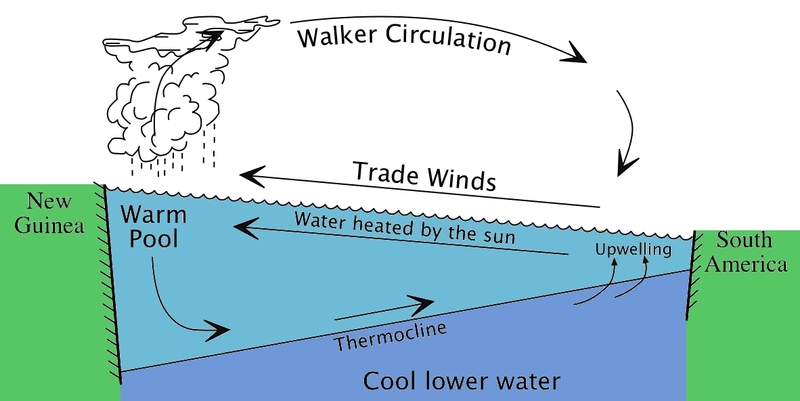 This upwelling of nutrient-rich cold water fosters marine productivity. Rainfall is found in rising air over the warmest water and the east Pacific is relatively dry. Check these animations out ! El Niño is the warm phase of ENSO associated with weak trade winds, warm water, high atmospheric convection, rain in Peru, drought in Australia and weak upwelling. La Niña is the cold phase of ENSO associated with strong trade winds, cool water, dryer than normal atmospheric conditions and strong upwelling. El Niño was named by peruvian fishermen to refer to the warm current that invades their western coastal waters around Christman time. For an unknown reason El Niño events occur irregularly at intervals of 2-7 years. The effects of El Niño mess up normal winter conditions throughout the Pacific Ocean and can persist into May or June. Severe El Niño events change global weather patterns and disrupt fisheries worldwide. Pacific Ocean under El Niño conditions. Source: W.S. Kessler, NOAA/PMEL. 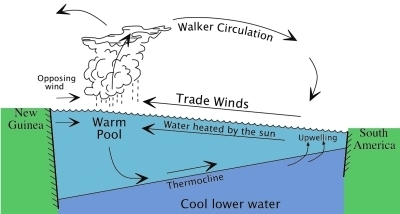 During El Niño, weak trade winds allow warm water to occupy much of the tropical Pacific Ocean. Heavy rains move into the central Pacific Ocean, causing drought in Indonesia and Australia. Rainfall follows the warm water eastward and can cause flooding in Peru and neighbouring countries. The meeting of westerly and easterly winds creates tropical cyclones over Polynesia. Finally the upwelling of cold water along the coast of Peru weakens and supply of nutrient-rich water is cut off, disrupting local fishing activities. The most severe El Niño of the century occurred in the winter of 1982 and 1983. Disastrous effects and meteorological changes occurred around the world. Total damages were estimated at over $8 billion. La Niña is essentially the opposite of El Niño: it is characterized by unusually cold sea surface temperature in the equatorial Pacific Ocean. During La Niña trade winds are very strong, promoting vigorous upwelling of cold water along the coast of Peru. In fact abnormally cold water can extend westward, into the central equatorial Pacific. La Niña is associated with below average rainfall along the coasts of North and South America.